Without a doubt, green building is on the rise as global trends attest. According to the World Green Building Trends survey, 51 percent of respondent firms committed to incorporating sustainability into more than 60 percent of their work by 2015. The same report also identified the benefits of green building that draw these businesses into sustainable construction: Greater health and productivity topped the list of social reasons for companies going green in their construction. On the other hand, energy saving led in the environmental reasons, with water use reduction, lower greenhouse gas emissions and natural resource conservation placing second in different regions. The construction of buildings consumes large volumes of resources, which is why integrating biodegradable, recycled and sustainable materials makes a huge difference. Biodegradable materials such as natural paints, which are void of the volatile organic compounds (VOCs) typically found in their traditional counterparts, eliminate indoor pollution and decompose naturally without contaminating the earth. Green construction materials are also great alternatives to prevent exhausting already depleted natural resources. Take, for example, steel beams that are made from recycled metal. Aside from eliminating the need to fell down trees for wood beams, recycled steel offers more resistance to severe weather conditions. In some cases, simply tweaking a building’s design can save on energy use and benefit occupants by taking advantage of on-site light and air. 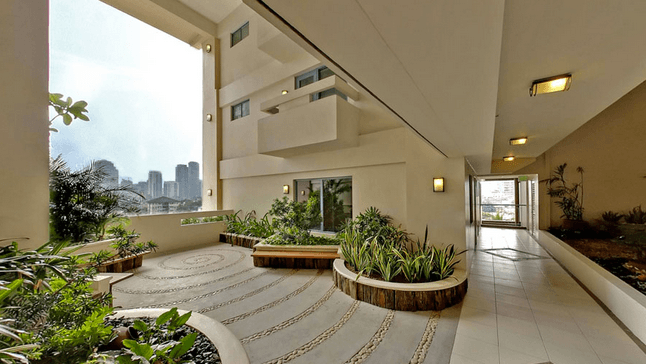 For instance, one of the growing trends for buildings and condominiums in cities and business districts in the Philippines is DMCI Homes’ Lumiventt Technology. Taken from the words “lumen” meaning light and “ventus” meaning wind, this green architecture design allows the free flow of natural light and air into high-rise condominiums. The Lumiventt Technology incorporates three-story high garden atriums every five floors and vents at both sides of the building, translating the basic principles of airflow into a breathable building design technology. Zero-energy buildings are specially designed and engineered to rely on renewable sources of energy, such as solar and wind power, allowing them to operate independent of the electric grid. This green scheme not only saves energy, but it also prevents additional greenhouse gas emissions. A zero-energy design utilizes solar cells and panels, wind turbines, and biofuels, among others, to provide for the building’s electricity and HVAC needs. While zero-energy buildings are more expensive upfront, the long-term benefits of energy-saving and sustainable business practices compel companies to consider it a sound investment. In fact, the 2013 World Green Building Trends survey reported that solar power, the most known renewable energy, was used by 67 percent of respondents. With buildings using 13.6 percent of the world’s potable water, or 15 trillion gallons per year, systems designed for water efficiency are targeted to lower water usage by 15 percent. According to Jerry Yudelso, green building expert and author of "Dry Run: Preventing the Next Urban Water Crisis," fresh water shortages call for awareness and actions in the face of this water crisis. In the same vein as zero-energy buildings, Yudelso outlined actions to achieve net-zero water use in buildings. These include water-conservation fixtures to efficiently manage water consumption, rainwater harvesting and greywater reuse to make use of recycled water, and on-site sewage treatment to remove contaminants from wastewater. Storm-water management aims to mitigate erosions in rural areas and floods in urban locations brought about by sudden downfalls of rain or snow. This is done by landscaping areas in order to manage the huge volumes of water in the wake of heavy storms and snowfalls. There are many storm-water management practices, and one of these is using plants through green infrastructure. Plants, whether in small containers, in strips on the ground or on green roofs, help absorb water and purify it in the process as storm-water passes through the greenery and the soil. In addition to that, plants have long been known to improve air quality as they absorb carbon dioxide. New materials are developed as smart, sustainable upgrades of traditional materials, as they effectively deal with the natural elements. For instance, a green version of windows are low-emittance windows, which are coated with metallic oxide to block the sun’s harsh rays during summer and keep the heat inside in the winter. More than serving the conventional function of windows, low-emittance windows significantly bring down HVAC costs. A more advanced version of this, which has yet to be widely and commercially available, is smart glass, also known as electrochromic glass. Using a small amount of electricity, the smart glass charges ions to control the amount of light it reflects. In effect, this glass tints during the sun’s peak hours and returns to transparent at night. Like low-emittance windows and smart glass, cool roofs reflect sunlight and heat away. Made of special tiles and reflective paint, cool roofs have high levels of solar reflectance and thermal emittance, which work together to absorb less heat. This keeps the buildings beneath cooler, thereby lowering energy use and bringing comfort to occupants. On the collective level, cool roofs help reduce the heat island effect in urban areas. Also, because of the reduced energy consumption, cool roofs decrease the amount of greenhouse gas emissions. Going green brings in a host of advantages that businesses simply cannot ignore. While some green construction technologies cost more upfront, companies reap benefits in the long run. What’s more, sustainable construction technologies are constantly being developed for wide-scale and more affordable distribution, what with the increasing demand for green buildings that underpin the optimistic outlook for the future of green building.